Home / Entertainment / Video / Weird / Spider vs Snake: Guess who won! Incredible! Spider vs Snake: Guess who won! Incredible! This spider proves that size doesn't matter when it comes to who's stronger. Watch what happened during their David and Goliath battle! Video below.. If you think that snakes are one of the deadliest and strongest animal in the world, this daddy long-legs spider will prove you wrong. In Australia, Patrick Lees a farmer from Weethalle in west of Sydney, witness an Australian battle of deadly animals. He found the spindy-looking daddy long-legs spider captured a snake. According to Patrick, it was his first time to see a spider kill a snake. The snake was a juvenile about one meter long. The photo he took shows a daddy long-legs spider griping up a lethal brown snake. Patrick left the snake in the web, where a group of spiders has begun spinning a web over the lifeless snake's face and tail. "I'm not going to deny them their victory," he added. 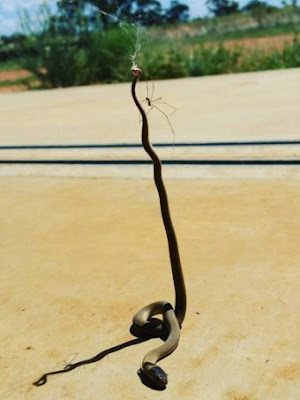 Because of this unbelievable sight, Patrick uploaded it on The Aussie Farmer Facebook page with the caption, "Death by daddy long-legs #killorbekilled". So if you already have phobias on spider and thought that were totally terrifying then this news will confirm all of your fears! Be careful when dealing with spiders!